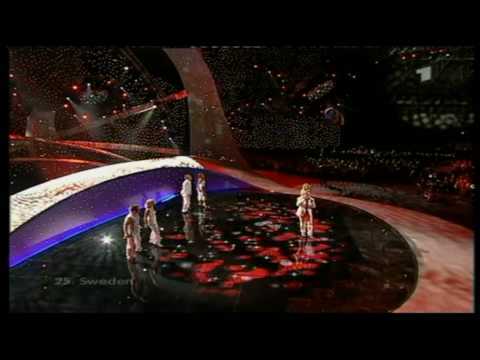 One of the most dedicated countries in the Eurovision Song Contest is Sweden. The interest at the Grand Prix is enormously and it is a big national spectacular every year. The Swedish pre-decision consisted of four preliminary rounds and one great final. There were more than 2600 song send to the Swedish television. In former years they all tried to reach to the great success of ABBA, with the winning song "Waterloo" in 1974. That's due to fact that there was often tried to imitate or remake ABBA. Unfortunately this year, too! The duo Fame - Jessica Andersson and Magnus Bäcklund - won the Swedish pre-decision and could oddly enough top the strong competitors like Alcazar, Afro-Dite, Jan Johansen, Maarja-Liis and Sahlene. The second last starting position in the Eurovision Song Contest always brings quite good positions, generally said. Unfortunately Sweden won't have a profit of this. This years Swedish entry "Give me your love" disappoints in the points of arrangement, melody and general impression. It is not that, what we are used of Swedish entries. Unfortunately!